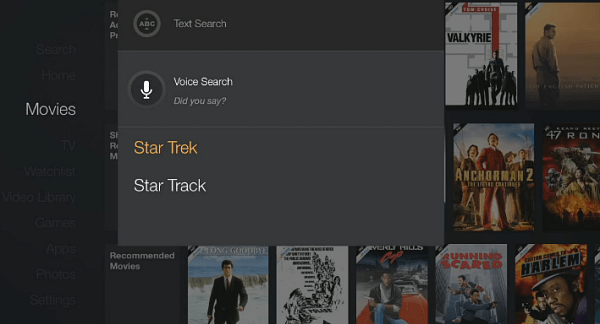 Amazon’s Fire TV has a unique feature that allows you to do voice search via the remote. While it’s cool, your searches are stored on Amazon servers. Fire TV is Amazon’s latest foray into the set-top-box streaming media and gaming device market. One of the notable features is its voice search capability. You hold down the Microphone button and speak in to it. For instance say “Star Trek” and a it will verify what you said, and list of all of the Trek content from Amazon Instant Video will display on your big screen. While it’s a great feature, a little known fact is that everything you speak into the microphone is saved on Amazon servers and tied to your account. When you use voice search on this Amazon Fire TV, we keep the voice recordings associated with your account to learn your voice and how you speak to improve the accuracy of the results provided to you and to improve our services. But if you’re privacy conscious and would rather the data not be stored, it can be deleted. Here’s how to do it. Open a browser on your computer and log in to your Amazon account. Then go to Your Account > Manage Your Content and Devices. That page will list the Amazon devices you own — Kindle’s, Kindle Fire, Fire TV etc. 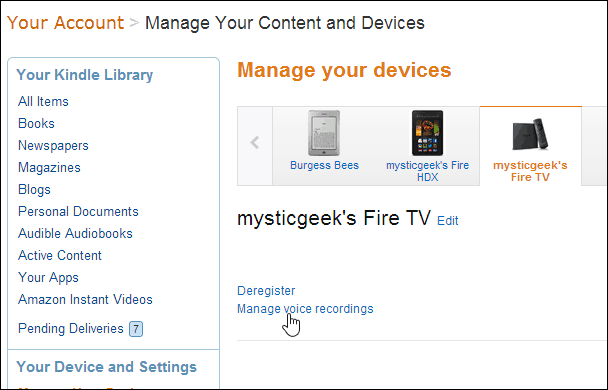 Select your Fire TV and then click Manage Voice Recordings listed underneath it. Note that here you can change the name of your Fire TV as well. In the dialog box that comes up, click Delete. That’s all there is to it. Whether deleting the voice recordings degrades your experience remains to be seen. So far I haven’t notices a lack in voice search performance. But I will keep the recordings for a month, delete them and let you know what happens. Do you own a Fire TV? What is your take on it so far? Leave a comment and tell us about it!